Breastfeeding and working? Make it work! Colostrum is one of the most amazing substances known to medicine – and one of the most misunderstood. If you’re thinking “What on earth is colostrum?”, then read on – you’re about to encounter the original liquid gold. Colostrum is the first milk that your breasts produce for your baby. Your breasts will already start to produce colostrum from somewhere around the middle of your pregnancy – so it is already there and waiting when your baby is born. Some women even leak colostrum while they are still pregnant! But don’t worry if you don’t notice anything in your breasts: most women don’t leak – in fact, in most cases you wouldn’t even know the colostrum is there unless you really know how to look. Colostrum is quite a funny-looking milk. In fact, it doesn’t look like milk at all – it’s usually translucent rather than opaque white, and the colour can range from clear to off-white, yellow, orange, brownish or even green tinged! It also usually isn’t very liquid; the consistency is more like syrup. Sometimes colostrum can be a reddish-brownish-pinkish colour from dried blood: this is known as “rusty pipe” colostrum (if you’ve ever opened a tap attached to an old, rusty plumbing system, you’ll know where the name comes from!). This happens if there was some bleeding in the ducts when the breast grew during pregnancy. It is actually quite common in first-time mothers and nothing to worry about; the colostrum is still perfectly safe for baby to drink. What makes colostrum so special? Because colostrum doesn’t look like “real” milk, some cultures (and even, I’m ashamed to say, some health professionals) regard it as an inferior substance that cannot possibly nourish a baby. The yellowish colour has even led many cultures to believe that colostrum is dirty, and that it will harm the baby. Nothing could be further from the truth! Extremely high in antibodies and other immune factors. Colostrum has been called a baby’s “first immunization”, because of the high level of disease-fighting antibodies it contains. Remember, up until the time of birth, baby has never been exposed to any foreign bacteria, so his immune system hasn’t been activated yet. Baby needs the immune factors from breast milk to protect him against illness until his own immune system is able to take over the job. This is especially important in the first few days, when babies are particularly vulnerable to infection. Easy to digest. Colostrum is lower in fat than mature milk – perfect for a baby’s digestive system. Fat is relatively more difficult for babies to digest. Concentrated protein. The protein levels in colostrum are around four times higher than in mature milk. This is perfect for a newborn: not only for growth, but because a lot of those proteins perform other functions in the baby’s gut and body, for example helping the gut to mature, assisting with the digestion of nutrients and protecting against illness. Protecting the gut. Colostrum contains high levels of growth factors that help the gut to mature. This is very important: at birth, a baby’s gut is “open”, meaning that any substance in the gut can easily pass into the blood. If a foreign substance is introduced while the gut is still open, it can more easily lead to the development of allergies and other illnesses. The growth factors in colostrum prompt the cells of the gut to grow and close up, and the antibodies in the colostrum goat the inside of the gut and repel invaders. Pre- and probiotics. While we are talking about the gut, it is also important to note that colostrum contains prebiotic substances as well as probiotic cells that help to colonise the baby’s gut with “good” bacteria. We’re learning more and more about how vital our gut bacteria are to our overall health – they don’t just protect against digestive disorders, but may even influence things like the risk of obesity and diabetes later in life. Babies get their healthy good bacteria primarily from two sources: vaginal birth and breast milk. So for babies born via c-section, especially, colostrum should be a non-negotiable. Thicker consistency makes it easy to swallow. Baby is still getting used to swallowing, and a thick liquid is less likely than a runny one to accidentally make its way into the lungs. Small volumes ensure that baby’s brand-new digestive system isn’t overloaded. The stomach can’t hold much liquid immediately after birth, so baby needs to be fed in small amounts. Small volume also means that the milk doesn’t flow too quickly, which gives baby more time to figure out how to co-ordinate swallowing and breathing. Colostrum really is the original “liquid gold”. It is food and medicine, all wrapped up in one perfect package. Probably the most common concern mothers have in the first few days is that the colostrum isn’t enough for the baby. It seems impossible that this watery liquid, coming out a drop at a time, could possibly be enough for a growing baby. And the fact that the newborn baby feeds very often simply seems to confirm this fear – surely if the baby was getting enough milk, he would go a few hours between feeds? Babies don’t need a lot of milk. In fact, they’re born with so much extra fluid that they can go a full 24 hours without drinking anything and not be harmed. The main function of colostrum on the first day is for health, not nutrition. Babies can’t drink a lot of milk even if they try. A newborn baby has a stomach capacity of about 5-7 ml – that’s just one teaspoon! So they could not take a lot of milk, even if it was there. (By the way, you’ll even see this in bottle-fed babies: on the first day of like they take very small volumes of milk, and if you force them to take more they simply vomit it up.) Now think: if you had to eat your food for the day one spoonful at a time, how many times a day would you need to eat? Exactly. Colostrum is thick and sticky – if you don’t believe me, try hand expressing it: you’ll see it’s really hard to get it out, kind of like trying to squeeze honey out of the bottle when it’s been in the fridge. Even baby has to work quite hard to get the colostrum out of the breast (although they’re much better at it that we are!) So even though baby is only taking 5 ml or so at a feed, it can take a loooong time to get that 5 ml out. It’s important to let baby take all the time he wants. And the bonus is, the more time baby spends suckling, the quicker your milk volume will increase, and the better your milk supply is likely to be even many months down the line. Come on, give your baby the best! 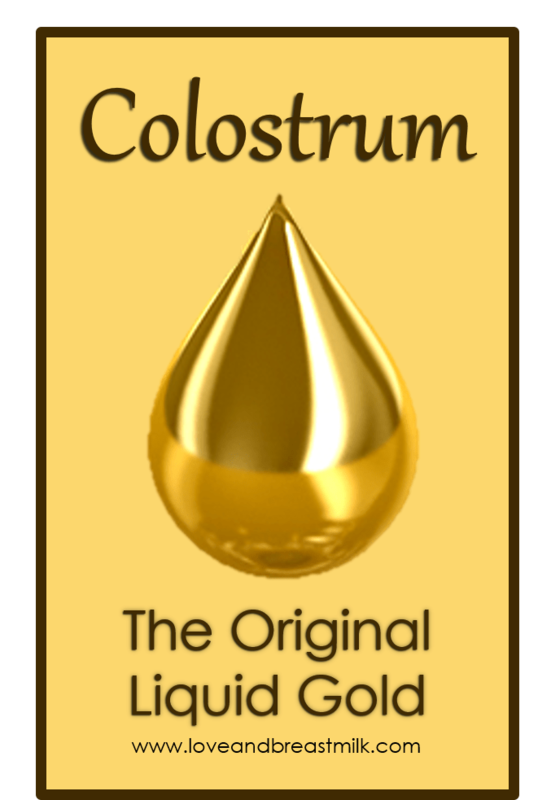 I hope you’ve seen in this post that colostrum is a truly amazing substance – everything your baby needs for the healthiest possible start to life. I also hope I’ve laid to rest any fears about that first milk not being enough, or being somehow inferior to “normal” breast milk. I encourage you – no, I urge you – to commit to giving your baby at least this much. Even if you have no intention to breastfeed, at least give your baby the gift of colostrum. It will benefit you both for months and years to come. Oversupply: more milk than you can handle! A device to measure breast milk intake?